13.1. What is Microsoft HyperTerminal? Microsoft HyperTerminal is a small program that comes with Microsoft Windows. 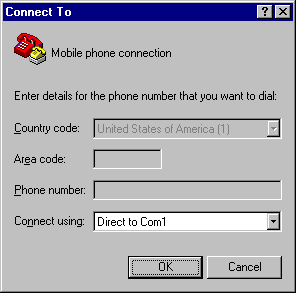 You can use it to send AT commands to your mobile phone or GSM/GPRS modem. It can be found at Start -> Programs -> Accessories -> Communications -> HyperTerminal. If you cannot find it and you are using Windows 98, then probably you have not installed it. You can go to Control Panel -> Add/Remove Programs -> Windows Setup tab -> Communications list box item -> Details button to install MS HyperTerminal. Before you start programming your SMS application, you may want to check if your mobile phone, GSM/GPRS modem and SIM card are working properly first. The MS HyperTerminal is a handy tool when it comes to testing your GSM devices. It is a good idea to test your GSM devices beforehand. When a problem occurs, sometimes it is difficult to tell what causes the problem. The cause can be your program, the GSM device or the SIM card. If you test your GSM device and SIM card with MS HyperTerminal and they operate properly, then it is very likely that the problem is caused by your program. For Linux users, minicom can be used instead of HyperTerminal. Put a valid SIM card into the mobile phone or GSM/GPRS modem. You can obtain a SIM card by subscribing to the GSM service of a wireless network operator. Connect your mobile phone or GSM/GPRS modem to a computer and set up the corresponding wireless modem driver. You should find the wireless modem driver in the CD or disk that was provided by the manufacturer. If the manufacturer does not provide such CD or disk with your mobile phone or GSM/GPRS modem, you can go to the manufacturer's web site and see whether the wireless modem driver can be downloaded there. If the wireless modem driver cannot be found on the web site, you can still use Windows' standard modem driver. Figure 5. 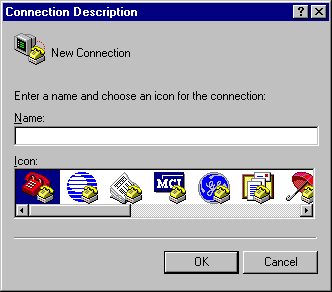 The screenshot of MS HyperTerminal's Connection Description dialog box in Windows 98. Go to Control Panel -> Modem. Then click the Diagnostics tab. In the list box, you can see which COM port the mobile phone or GSM/GPRS modem is connected to. Figure 6. 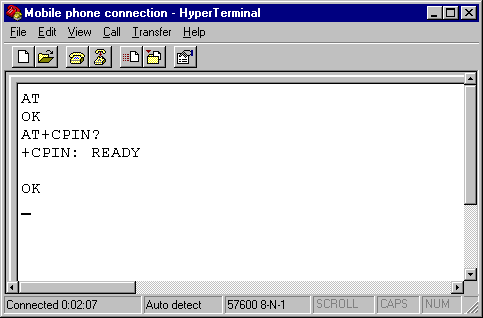 The screenshot of MS HyperTerminal's Connect To dialog box in Windows 98. (To find the correct port settings that should be used with your mobile phone or GSM/GPRS modem, one way is to consult the manual of your mobile phone or GSM/GPRS modem. Another way is to check the port settings used by the wireless modem driver that you installed earlier. a. Go to Control Panel -> Modem. b. Select your mobile phone or GSM/GPRS modem in the list box. c. Click the Properties button. d. The Properties dialog box appears. The Maximum speeds field on the General tab corresponds to HyperTerminal's Bits per second field. Click the Connection tab and you can find the settings for data bits, parity and stop bits. Click the Advanced button and you can find the setting for flow control. a. Go to Control Panel -> Phone and Modem Options -> Modems tab. d. The Properties dialog box appears. Click the Advanced tab and then click the Change Default Preferences button. Figure 7. The screenshot of MS HyperTerminal's Properties dialog box in Windows 98. Type "AT+CPIN?" in the main window. The AT command "AT+CPIN?" is used to query whether the mobile phone or GSM/GPRS modem is waiting for a PIN (personal identification number, i.e. password). If the response is "+CPIN: READY", it means the SIM card does not require a PIN and it is ready for use. If your SIM card requires a PIN, you need to set the PIN with the AT command "AT+CPIN=<PIN>". Figure 8. The screenshot of MS HyperTerminal's main window in Windows 98. If you get the responses above, your mobile phone or GSM/GPRS modem is working properly. You can start typing your own AT commands to control the mobile phone or GSM/GPRS modem. 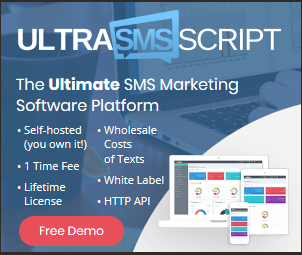 Further details about how to use AT commands to send and receive SMS messages will be provided in the following sections.